This app is meant to all be in good fun, but it's potentially a weapon in the hands of stalkers. It was the flush end of a pleasurably hot day — 85 degrees in March — and we were all sipping bitter cocktails out in my friend’s backyard, which was both his smoking room, beer garden, viticetum, opossum parlor and barbecue pit. I was enjoying the warm dusk with a group of six of my best friends, all of whom seemed interested, except for my girlfriend… who immediately grimaced. She turned to our friends, apologetically. I sputtered, I nevered, and I denied it, but it was true. I had become obsessed with Girls Around Me, an app that perfectly distills many of the most worrying issues related to social networking, privacy and the rise of the smartphone into a perfect case study that anyone can understand. It’s an app that can be interpreted many ways. It is as innocent as it is insidious; it is just as likely to be reacted to with laughter as it is with tears; it is as much of a novelty as it has the potential to be used a tool for rapists and stalkers. And more than anything, it’s a wake-up call about privacy. If you want to be safe online, you need a virtual private network. With loads of VPN ratings and reviews, VPNTeacher makes it easy to find the perfect solution to ensure your privacy. This post is sponsored by VPN Teacher. The only way to really explain Girls Around Me to people is to load it up and show them how it works, so I did. I placed my iPhone on the table in front of everyone, and opened the app. The splash screen elicited laughter all around. It’s such a bitmap paean to the tackiest and most self-parodying of baller “culture”; it might as well be an app Tom Haverford slapped together in Parks And Recreation. But it does, at a glance, sum up what Girls Around Me is all about: a radar overlaid on top of a Google Map, out of which throbs numerous holographic women posing like pole dancers in a perpetual state of undress. “Okay, so here’s the way the app works,” I explained to my friends. 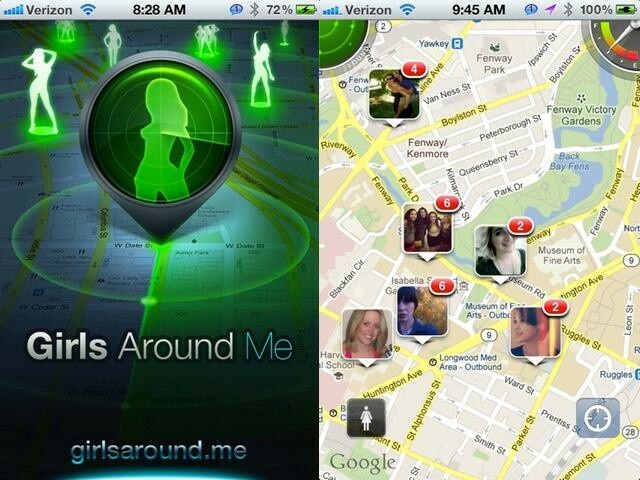 Girls Around Me is a standard geolocation based maps app, similar to any other app that attempts to alert you to things of interest in your immediate vicinity: whether it be parties, clubs, deals, or what have you. When you load it up, the first thing Girls Around Me does is figure out where you are and load up a Google Map centered around your location. The rest of the interface is very simple: in the top left corner, there’s a button that looks like a radar display, at the right corner, there’s a fuel meter (used to fund the app’s freemium model), and on the bottom left is a button that allows you to specify between whether you’re interested in women, men or both. It’s when you push the radar button that Girls Around Me does what it says on the tin. I pressed the button for my friends. Immediately, Girls Around Me went into radar mode, and after just a few seconds, the map around us was filled with pictures of girls who were in the neighborhood. Since I was showing off the app on a Saturday night, there were dozens of girls out on the town in our local area. Girls Around Me’s splash screen (left) and geo-maps interface (right). Lots of girls around the MFA. “How does it know where these girls are? Do you know all these girls? Is it plucking data from your address book or something?” another friend asked. One of my less computer-affable friends actually went pale, and kept on shooting her boyfriend looks for assurance. A Linux aficionado who was the only person in our group without a Facebook account (and one of the few people I’d ever met who actually endorsed Diaspora), the look he returned was one of comical smugness. “But wait! It gets worse!” I said, ramping things up. The Girls of Girls Around Me. It’s doubtful any of these girls even know they are being tracked. Their names and locations have been obscured for privacy reasons. Throughout this demonstration, my group of friends had been split pretty evenly along gender lines in their reactions. Across the board, the men either looked amused or (in the case of my beardo Diaspora friend) philosophically pleased with themselves about their existing opinions about social networking. The women, on the other hand, looked sick and horrified. It was at this point, though, that the tendrils of the girls’ unease — their deeply empathic sense of someone being unsafe — seemed to creep through the entire group. Often times, a writer uses tricks and exaggerations to convey to a reader the spirit — if not the precise truth — of what occurred. I just want to make clear that when I say that one of my friends was actually on the verge of tears, you understand that this is not such a trick. She was horrified to the point of crying. In fact, Girls Around Me wasn’t even the real problem. But I didn’t have an easy answer ready for my friend’s last question. I’d been playing with the app for almost two months. Why hadn’t I written about it? None of the answers made me look good. Part of it was because, like many tech professionals, I had taken for granted that people understood that their Facebook profiles and Foursquare data were publicly visible unless they explicitly said otherwise… and like my beardo Diaspora friend, I secretly believed that people who were exposed this way on the Internet without their knowledge were foolish. It was in just this spirit that I’d shown off the app to my friends in the first place. It was getting late, we were all drunk or on the verge of getting there, and it had been a perfect day. It would have been so nice to finish things with a laugh. But now, as six intelligent, sophisticated friends from a variety of backgrounds surrounded me — some looking sick, some looking angry, and some with genuine fear in their faces — I didn’t think Girls Around Me was so funny. It had cast a pall across a beautiful day, and it had made people I loved feel scared… not just for the people they loved, but for complete strangers. So I’m writing about it now. Not because Girls Around Me is an evil app that should be pulled from the iOS App Store, or because the company that makes it — Moscow-based i-Free — is filled with villains. I still don’t believe that there’s anything wrong with what this app is doing, and the guys at i-Free are super nice, and certainly don’t mean for this app to be anything beyond a diversion. So, the reason I’m writing about Girls Around Me is because I finally know what to say about it, and what it means in the greater picture. 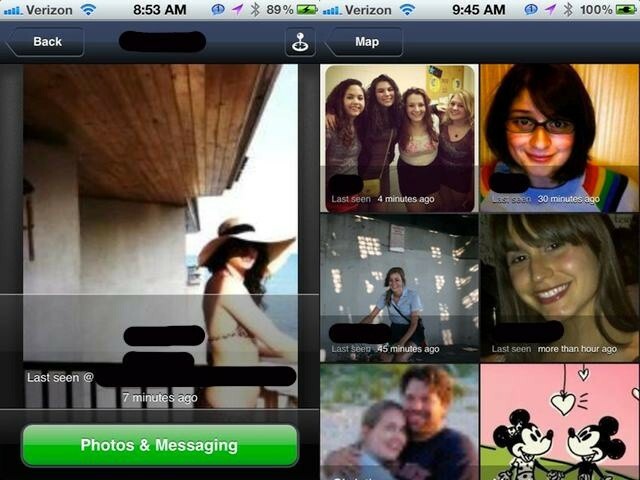 Girls Around Me isn’t an app you should use to pick up girls, or guys for that matter. This is an app you should download to teach the people you care about that privacy issues are real, that social networks like Facebook and Foursquare expose you and the ones you love, and that if you do not know exactly how much you are sharing, you are as easily preyed upon as if you were naked. I can think of no better way to get a person to realize that they should understand their Facebook privacy settings then pulling out this app. That’s why I hope you’ll go download Girls Around Me on your iPhone or iPad. It’s free to download. Show it to someone. Give them the same demo I gave to my friends. Then, when they ask how it’s done and how they can prevent an app like Girls Around Me from tracking them, educate them about privacy. Update: In response to this story, Foursquare has killed Girls Around Me’s API access to their data, effectively knocking the app out of commission. For more details and a statement from Foursquare, read here. Update 2: As of Saturday evening, Girls Around Me has been yanked from the iOS App Store. Update 3: Girls Around Me developer i-Free has released a full statement on the app, in which they say they’ve done nothing wrong and been made a scapegoat for privacy issues. You can read their response — and ours — here. Update 4: Think this issue’s dead now that Girls Around Me has been killed? It’s not at all. In fact, it’s very possible Girls Around Me could come back with its core functionality intact. Update 5: We’ve written a guide on cutting apps like Foursquare and Facebook off from tracking your data. Read it here. Update 6: Girls Around Me’s developer gave Cult of Mac an interview, in which they said that the app wasn’t for stalking girls without their knowledge, but for avoiding women who are ugly.